This is the public Home page. Members should log in top right. This should take you to the Members Area - also accessible using this link, or from the menu, left. 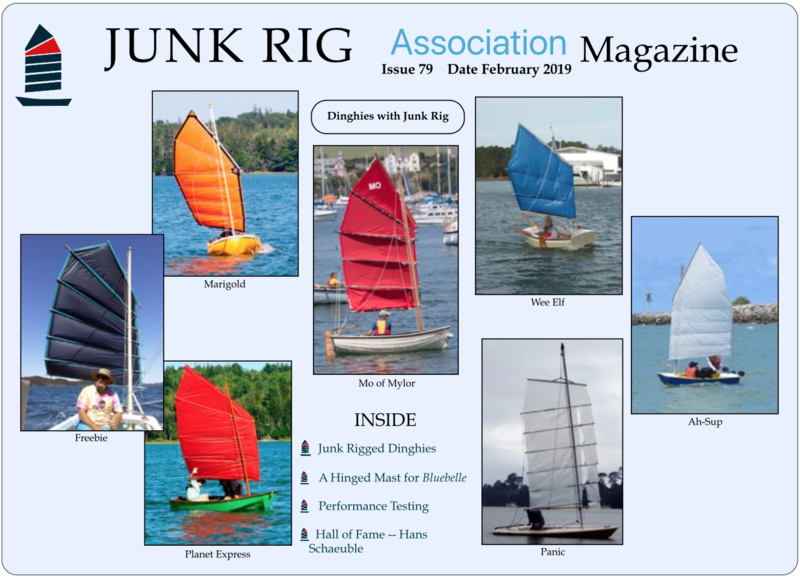 Formed in 1979 at the Southampton Boat Show by a group of junk rig enthusiasts, the JRA (Junk Rig Association) is for its members and about their boats and their rigs. We aim to: promote the use of the junk rig by encouraging members to organise 'rallies' and 'junkets' (see About Us) and via our tri-annual Magazine and this site; encourage the development of junk and related rigs, the building or conversion of boats to the junk rig, and the use of vessels with the rig or its derivatives; create an international community of people who've already 'junked' their boat, are thinking of doing so, or are just interested in learning what it's all about. The final version of the Junk Rig Glossary is now available and can be found under the Junk Information menu, or directly here. This Glossary lists all the terms related to the junk rig, its implementation and use. 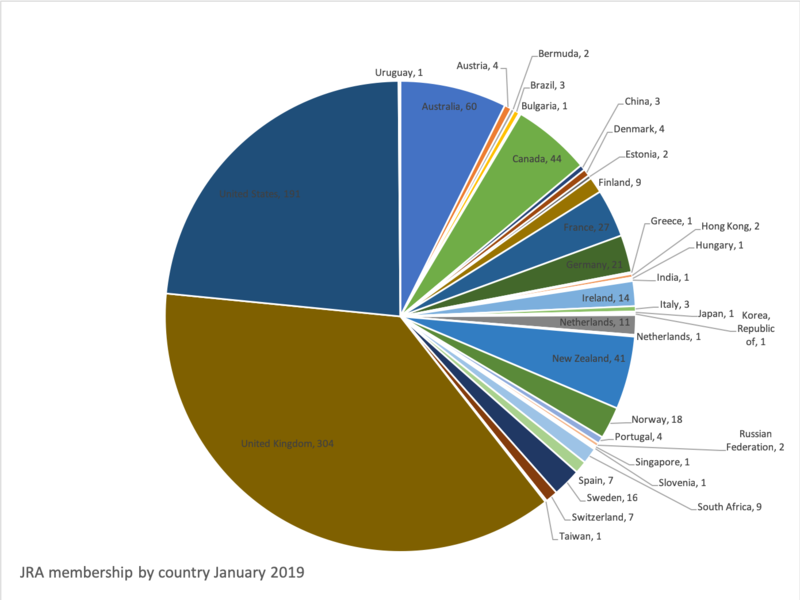 We were formed in the UK, and although our 'office' address and banking remains in the UK we are run by an increasingly international Committee via the Internet. A number of posts become vacant every year, at the AGM, so if you choose to join you could also put your name forward to help run the 'club'. It doesn't run itself. Our membership is now more than 50% outside the UK. Click the chart for detail. The original boat plans for V227, were purchased in 1999 from Laurent Giles Ltd. Between then and 2005, “D.R” worked on building the boat, but then, sadly he died. Subsequently, the boat was was stored in a boatyard until 2013, which was when I bought it. We continued with the building. The hull is constructed of two layers of strip planking, encapsulated in epoxy. Sandwiched between the strips is a layer of aramid fibre and there are additional strips of carbon fibre on the interior of the hull. The exterior is sheathed with a layer of glass fibre and epoxy, which then had epoxy primer over it. The topsides were painted and the bottom antifouled. The boat has a laid teak deck and is fitted out down below in mahogany. 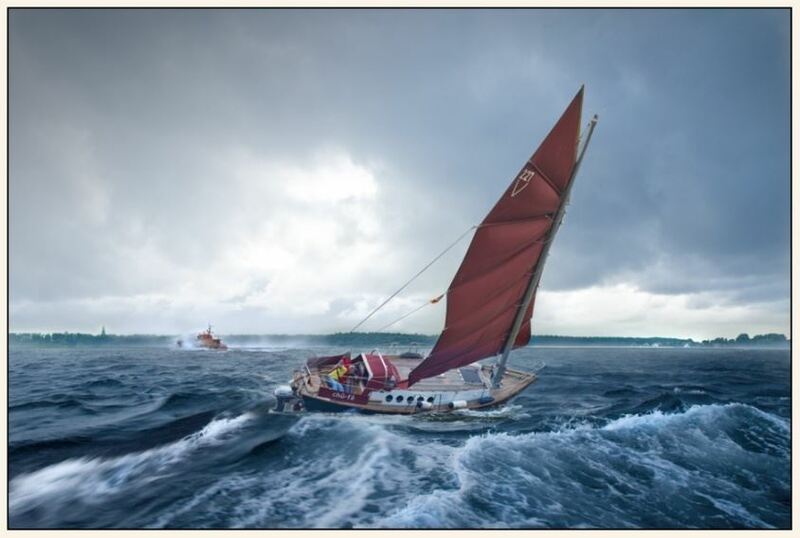 As Victor Winthertun had already converted a Vertue to junk rig, in 2015 we asked him if we could use his information and he sent us calculations for the mast; from Sebastian Henschel (Tuchwerkstatt, Peregrine) we got a sail plan, 20% larger (49.5 sq m) than the original plans . We launched Chū-Fā in 2016. Unlike with Victor’s sail, Chū-Fā’s red sail has camber, with more at the bottom than the top. The yard is a wooden one, but the battens are of aluminium. There is no luff-hauling parrel but I have a reversed running-tack parrel to give me more ability to trim the sail. 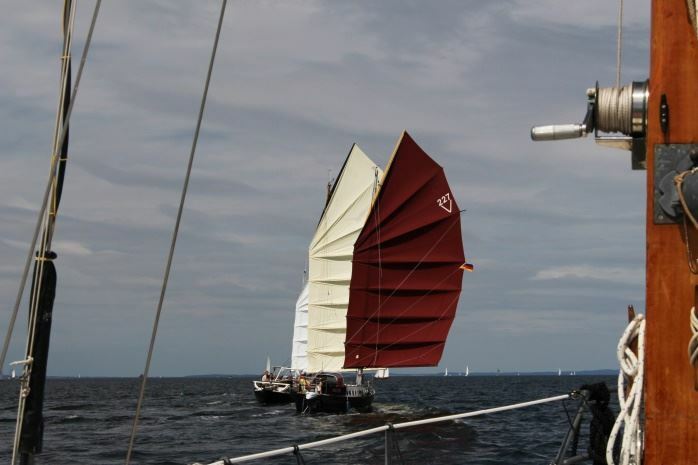 The sail is made out of Weathermax 80, a material normally used for sprayhoods, but which Sebastian has used for several sails. It is designed to resist UV degradation and general weathering. 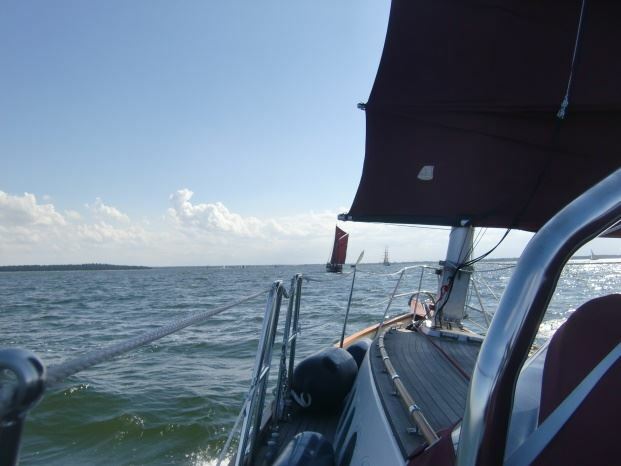 With the larger sail area, we have better performance in light winds, but have no worries due to the ease of reefing. The idea for the tabernacle came from Speedwell of Hong Kong. This allows us to lower the mast and to put it on a “Targa frame”, which can be seen in the photos, above the sprayhood. In 2016-2018, we cruised around the Baltic Sea, visiting Poland, Sweden, Denmark and the German coast. However, we would like to do some longer distance cruising and feel that we possibly need a boat of 10-11 metres to do this, living aboard full time. This would mean we would have to sell Chū-Fā, which is otherwise so near to a perfect boat as is possible to get and I would like to continue to make her even better. And it has to be said said that Shirley Carter has been sailing her Vertue for many thousands of miles and for many years. So we will see. 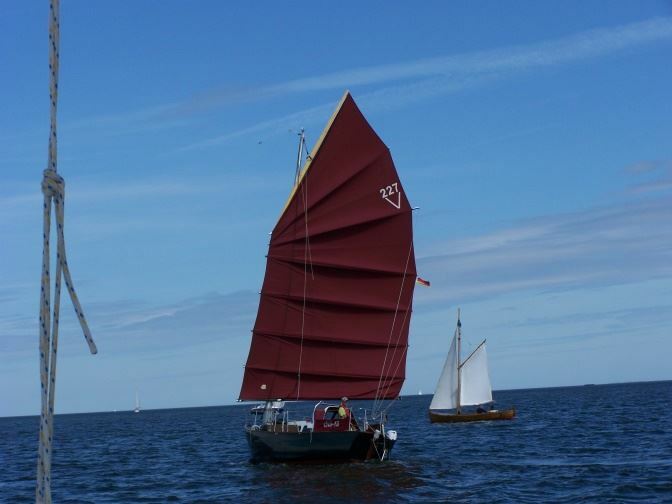 In 2017 we sailed in “Gaffelrigg 2017”, together with Peregrine at Greifswald, which is where the photos were taken. Our Boat of the Month Archive is here. Via this page you can, even as a non-member, access many of our resources and explore our services. To get full access you'll need to become a member - click JOIN US in the menu on the left. Download Ash Woods' easy-to read Beginners' Tour [pdf, 108 Kb]. Ash wrote this for us while he was still a 'newbie'. Thanks, Ash. Watch a YouTube presentation created as a junk intro for yacht clubs, or download as a pdf [7 Mb]. Read Annie Hill's Fifty Advantages of the Junk Rig [pdf, 106 Kb, compiled from members' musings in the General Forum. Download Arne Kverneland's pdf [987 Kb] 'Junk Rig for Beginners' in English or French. Arne has put much thought and energy into developing cambered panel rigs. This article - one of many which you can find here - goes back to basics. It's a great read before you tackle something just as essential - Hasler/McLeods' bible Practical Junk Rig. Explore membership benefits in About Us - scroll up until you see the menu on the left. Find out about junks in Junk Information. Browse some of the latest forum posts (right). Check out photographs of members' boats in our own ever-expanding Photo Gallery. Watch these Google videos or see some stills by clicking on the mosaic at the top of this page. Use the search box below to explore the public pages of the site. So lower your sails (easy in a junk) and Join Us. For how to see the menu on the left). We're great value. Converting your boat to junk rig is the best thing you can do to improve her safety and efficiency! The adjacent posts are from selected public fora. To see all the public posts, use the menu at the left. Only members can post on this site. On members' pages they are attributed by name, but in 'open' fora such as those used here, they may be shown as 'Anonymous' for reasons of privacy and security. Oryx is for Sale Again !